After more than 48 hours of continuous protest and withdrawal of the suspension of 8 students by the administration, students have been assured that their grievances will be addressed on 14th September 2018. On Monday, 27th August 2018, the students of Delhi School of Journalism staged a protest outside the Arts Faculty demanding a meeting with the Vice Chancellor of the University of Delhi. The protest began when Professor JP Dubey on Friday, 24th August 2018 told the students that the administration cannot give a deadline to any of the demands of the students and they should do whatever they want to in their capacity. The students have time and again protested about the poor infrastructure facilities, unavailability of the media lab and the high fees and wanted to meet the VC regarding the same. On the same day, a meeting was organized by the administration to look into the matter again, but the meeting ended in a deadlock. The students continued their sit in demonstration in the evening and few stayed inside the college campus overnight. The agitation continued on 28th August 2018. The administration agreed to send a delegation of 6 students to meet the VC and present their grievances to him. However, in the evening, this proposal was rejected. The students were also locked inside the college campus. The situation worsened when the students were manhandled by the security guards of the college. Ambuj Bhardwaj, a second year student was hit by one of the guards. Delhi Police was called in to intimidate the protestors both in afternoon and in the evening. A suspension letter was issued to 8 students of DSJ around 8 p.m. on 28th August 2018 for repeatedly violating the discipline of the Delhi University while disrupting the classes since August 27 and not letting administration to carry on their official work by blocking the entrance to the Director’s room. However, the revocation to the suspension came in half an hour after protest was called off by the students. The same was conveyed to the students through an e-mail late at night. 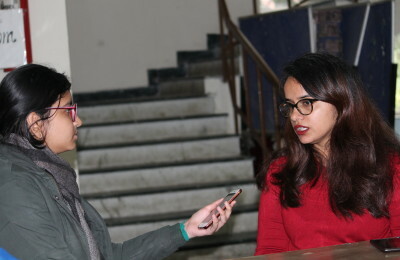 Neeta Sehgal, Proctor, University of Delhi came and discussed the matter with the students. She also gave a written assurance to the students to look into the matter and solve the grievances of the students. She has promised to meet the students on 14th September 2018. Manasvini Yogi, OSD, Delhi School of Journalism informed the students on 29th August 2018 that a media lab has been arranged for the students in the School of Open Learning. The practicals will be held in the lab from 15th September 2018 onwards.